Stride (Released when both players' vanguards are grade 3 or greater! )-Stride Step-[Choose one or more cards with the sum of their grades being 3 or greater from your hand, and discard them] Stride this card on your (VC) from face down. 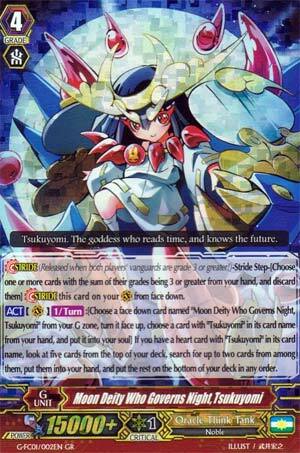 [ACT](VC)[1/Turn]:[Choose a face down card named "Moon Deity Who Governs Night, Tsukuyomi" from your G zone, and turn it face up & Choose a card with "Tsukuyomi" in its card name from your hand, and put it into your soul] If you have a heart card with "Tsukuyomi" in its card name, look at five cards from the top of your deck, search for up to two cards from among them, put them into your hand, and put the rest on the bottom of your deck in any order. I'll let Nanya make the conscious choice of giving me the last of the G Booster 3 stuff just so I don't have to willingly inspect the boring leftovers. Let's do some more Fighter's Collection instead. Starting the week off is Moon Deity who Governs Night, Tsukuyomi. If you have a Tsukuyomi heart, once per turn you G Persona Blast and put a Tsukuyomi from your hand into the soul to look at the top 5 cards of your deck, add two of them to the hand, and put the rest at the bottom of the deck in any order. So obviously it's meant to aid in getting to the stack of cards the ride chain put at the bottom. I guess if you stride consistently enough it MAY be as fast as the old backup CEO Amaterasu but to be honest, aside from the higher power option, I don't feel comfortable doing this now that faster decks can wreck you before you even hit the stack. It's nice for nostalgia but in this day and age it's a bit slow. And it requires taking liberties just to make the stacking viable. It's efficient enough and a free +1 is always okay, but it's just not fast enough and it does little to recover you from the big wreckers.